This is a sneak peek of one of the cards that will be made at my upcoming Valentine's Day Card Class on January 28th, 2012 at Georgia's Quilt Shop from 10:00 - 12:00. If you are interested in attending, please call 951-845-8009 to sign up. This card was also entered into a contest over at Iralamija's Blog. I used 2 images from her collage sheets which can be purchased in her Etsy Shop. I am having a lot of fun creating with these collage sheets! Here is a tag I'd also like to share. I made this tag for a recent Valentine Tag Swap that I participated in. 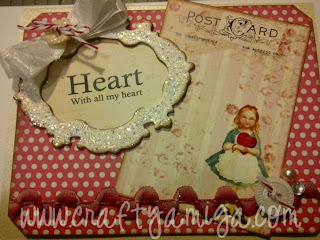 The paper & cardstock is from Stampin' Up!! 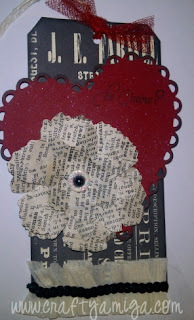 I also used some vintage dictionary paper for the flower that was cut using Tim Holtz Tattered Floral die. 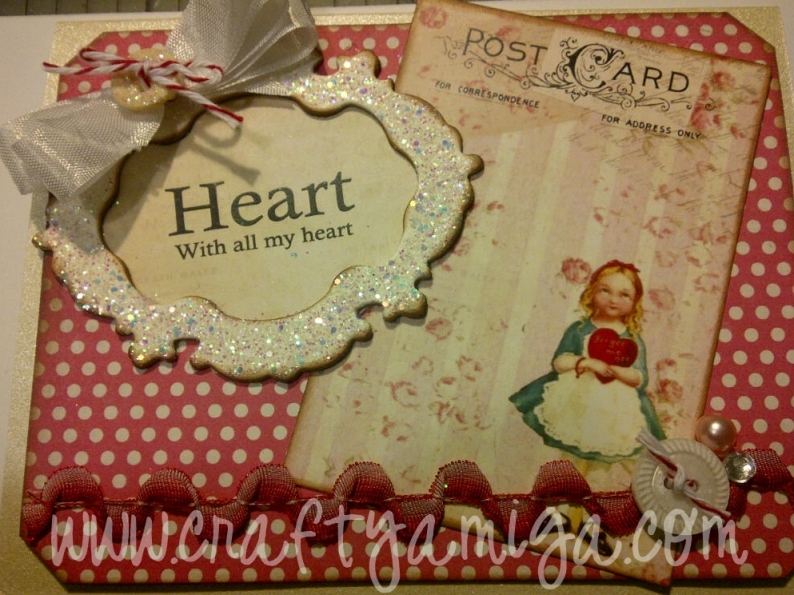 Then I used the nesting lace hearts die, which is a new release from Lifestyle Crafts. I embellished the tag with some crepe paper, sequins and a glittered button from my craft stash. I sentiment, "Be Mine" is a stamp from Impression Obsession.